The evening’s performances began with this darkly comic tale that puts something of a macabre twist on the concept of the blind date, as well as Existentialist philosophy. 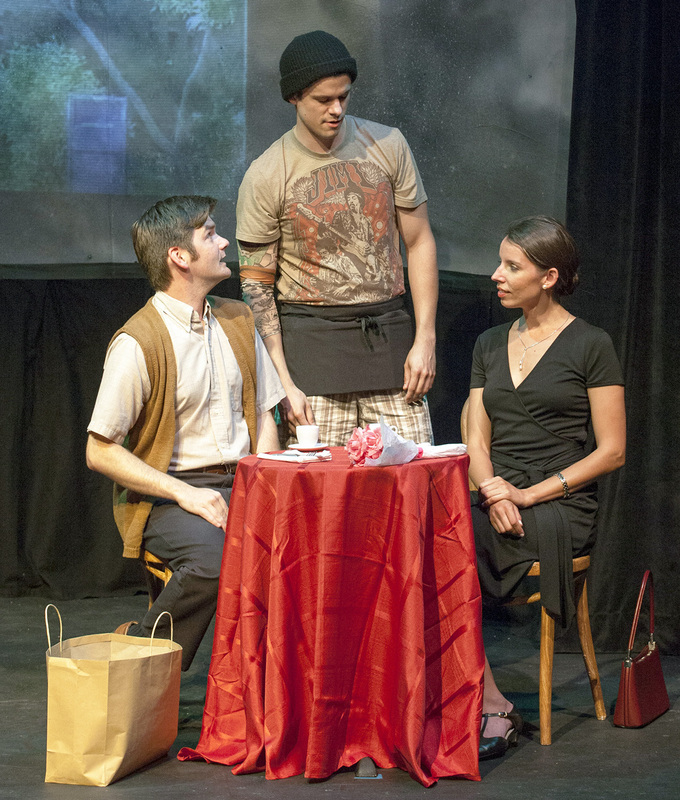 This simply staged play starts off as a simple coffee meeting between the timid Jack (Nathan Bush) and the more confrontational Pamela (Ellie Schwetye), but then gradually develops into a rather extreme form of “Truth or Dare” involving the pair and their nameless, snarky waiter (Paul Cereghino). The script is witty and clever in places, although I could figure out where it was going about halfway through the story, and the conclusion is not a little disturbing. The actors give strong performances all around, with Bush and Schwetye managing to keep their characters engaging even as the proceedings grow darker and darker, with Schwetye expertly manipulating the initially mild-mannered, insecure Bush. Cereghino, as both antagonist and catalyst for the play’s action, turns in a believably abrasive performance as well. It’s a satirical exploration of some of the more unsettling aspects of human nature, although the conclusion does seem a bit abrupt and oversimplified. It’s an intriguing concept, brought to life by some solid direction and the strong performances of the three performers. Two strangers meet in a hospital corridor–the middle-aged Aaron (Chopper Leifheit), who is battered and bruised an appears to be under arrest, guarded by a somewhat menacing police officer (GP Hunsaker); and the young, troubled Mara (Caroline Adams). The two form an unlikely connection as the details of Aaron’s arrest and both patients’ injuries are revealed, and Aaron convinces the initially suspicious Mara to retrieve a poetry notebook from his hospital room. Issues of trust, respect, courage and hope are discussed via the poetry of Emily Dickinson, W.B. Yeats, Sylvia Plath and others, as these two very different people learn to communicate and learn from one another. As is the theme for most of this evening’s presentations, the acting is what makes this production. It’s an intriguing idea, although the play’s action moves a little too quickly conclusion is too easily achieved. There’s a credible chemistry between these two performers–Adams’s guarded but ultimately vulnerable Mara and Leifheit’s engaging, erudite Aaron. The hospital atmosphere is effectively achieved through Patrick Huber’s simple set design and Carla Landis Evans’s costumes, as well. This is a play that I think needs more development to be a more effective script, as right now it projects a sort of movie-of-the-week vibe. It’s enjoyable as a performance, and STLAS has produced it probably as well as the play will allow. This is, hands down, my favorite of the plays I saw. 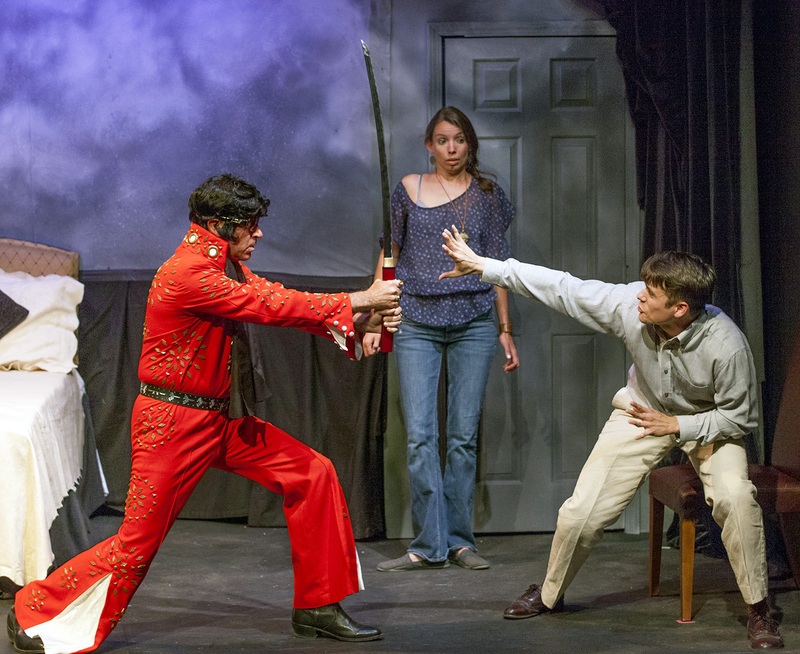 Blending sharp comedy, fantasy, and an intriguing blend of absurdity and humanity, this play tells the story of a young couple, Jesse (Cereghino) and Bonnie (Schwetye) on a road trip to New Orleans, who have stopped in Memphis along the way to visit Graceland, the home of the legendary Elvis Presley. When Bonnie convinces Jesse to break from the guided tour and explore Elvis’s bedroom, they are surprised to find a belligerent, overly friendly jump-suited character claiming to be the King himself (Leifheit), who challenges the couple’s thinking about reality, authenticity and their perceptions of one another. So, is this guy really Elvis and what does he want from this conflicted couple? What does this confrontation mean for all three players here? Those questions are all answered by the play and it would spoil far too much of the fun to say much else. This is a very cleverly written, dynamically staged and impeccably acted production that never gets boring and continues to challenge assumptions, with great costuming and sets that add to the overall atmosphere of this hilarious and compelling show. Leifheit is a delight as the energetic and charming Elvis, and Schwetye as the adventurous fan Pamela and Cereghino as the more skeptical, somewhat pretentious Jesse also give winning performances. The script is fast-moving, as is the staging, and there is never a dull moment as these three perform their roles with enthusiasm. This is a very clever idea that has been given an ideal staging at STLAS, and I really hope that there will be more productions of this play in the future. Although I respect Elvis’s talent, I’m by no means a die-hard fan, and the beauty of this show is that I think it has plenty of appeal for fans and non-fans alike. Of the four plays presented here, this is the one that I think has the most potential for future stagings. It’s definitely a crowd-pleaser. The final play of the evening, by the festival’s namesake playwright, is something of an enigma. As a showcase for actors, I think it’s excellent, and the script is full of strong, dramatic exchanges, although I don’t find anything particularly innovative about the script itself. The plot is very predictable, telling the story of a confrontation between two men in a park. As the seemingly happy, relaxed Bill (William Roth) sits on a park bench to eat his lunch (with the sounds of children playing nearby clearly audible), he’s soon joined by the more serious, purposeful Kip (Reginald Pierre), whom Bill has never met before but who has a grievance involving his wife and, particularly, his child, whom Bill has befriended. The issue with this play is that I don’t think I really need to say anything else about the plot for it to be any more obvious where this story is headed. I found myself hoping for some surprises, but there weren’t any. Kip challenges Bill, and Bill tries to defend himself and rationalize his behavior,and that’s pretty much all that goes on. As a character study, it’s interesting, and both actors portray their characters well–Pierre with effective righteous anger spurring on Roth’s initially affable and increasingly defensive Bill to gradually implode with devastating intensity. The dialogue is good and the performances are great, but this kind of situation has been staged many times already. It’s an important, timely topic, although this play doesn’t really bring anything new to the discussion, simply providing a situation for two actors to act. It’s very well presented, and LaBute is a master of dialogue, but I find myself wishing there was more of a story to go along with that dialogue. 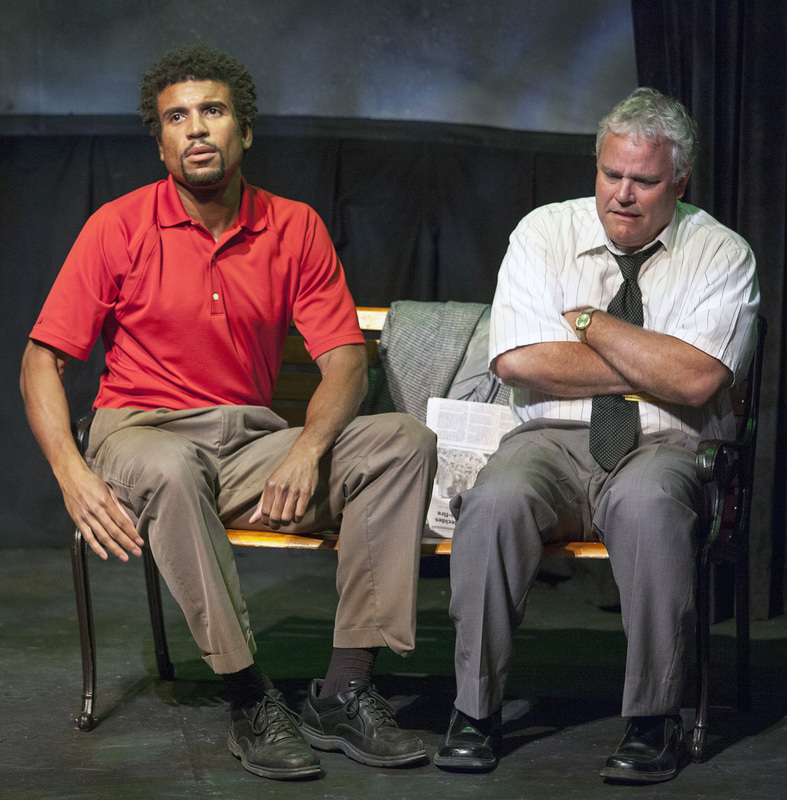 Overall, I think the LaBute New Theater Festival is an exciting development for the theatrical community in St. Louis. 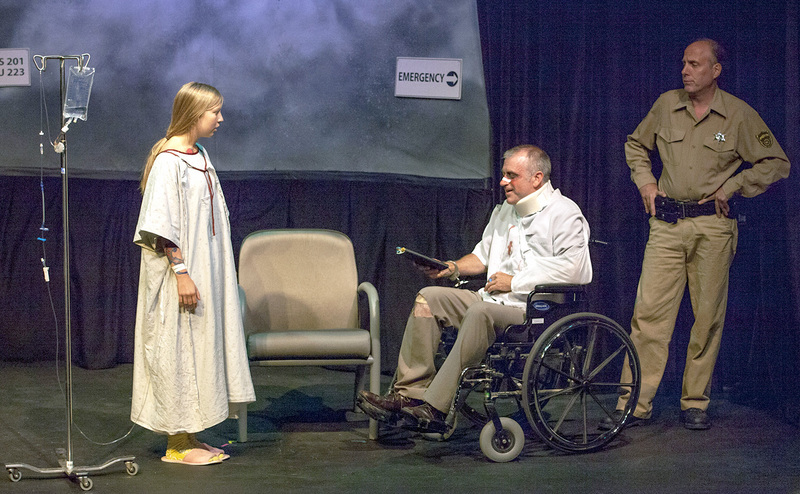 Developing strong new scripts and showcasing the talents of excellent local actors, St. Louis Actors’ Studio has made a festival to look forward to. I hope this is a tradition that continues for many years in the future.